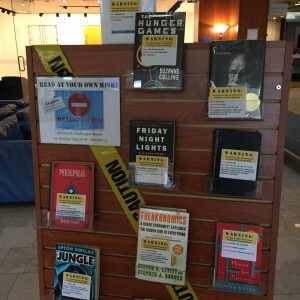 Banned Books Week 2015: Events Around the Country! Banned Books Week kicks off this weekend, and CBLDF is proud to be a perennial sponsor of this exciting celebration to of the right to read! We asked our supporters to let us know about their plans for Banned Books Week, and there are some pretty amazing events afoot around the nation! 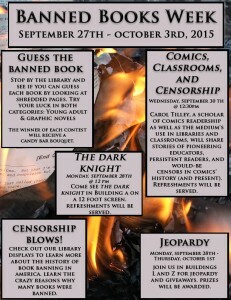 If you are planning a Banned Books Week event or display, it’s not too late to let us know about it! We’ll update this calendar of events throughout the week. Send the info about your event to betsy.gomez@cbldf.org! 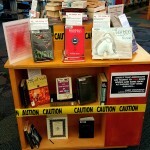 We’ll be adding and updating events throughout Banned Books Week, so please check back! To help raise awareness regarding the censorship of books, the San Diego Public Library, in partnership with the San Diego Costume Guild, presents the 4th annual All-Day Read-Aloud Read-a-thon on Friday, October 2, 2015 from 12 to 5 p.m. in the Garden Courtyard at the San Diego Central Library at the Joan Λ Irwin Jacobs Common, located at 330 Park Blvd in downtown San Diego. The public is invited to read alongside librarians, volunteer and teen readers, and special guests from the Costume Guild, who will appear as costumed characters from many favorite books including Harry Potter and Alice in Wonderland. Saturday, October 3, 5:00 – 7:00 p.m.: “Banned Books Read Aloud,” an all-ages event celebrating challenged and banned books and inviting community members to read aloud from their favorite censored tome. Join the the American Civil Liberties Union of Louisiana, New Orleans Gulf South Booksellers Association, and the New Orleans Public Library as we celebrate the FREEDOM to read, write, create, and perform! 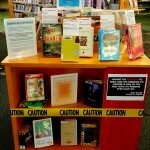 Each year, libraries and bookstores around the country celebrate our freedom to read during Banned Books Week. 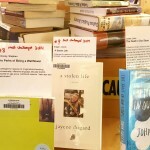 Since the first Banned Books Week in 1982, the American Library Association reports that over 11,000 books have been challenged or banned in the United States. J.K. Rowling, Judy Blume, and Stephen Chbosky are among the authors whose works have been banned or challenged in the United States. As recently as last year, there were over 300 challenges reported to the American Library Association’s Office for Intellectual Freedom. 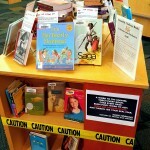 The individuals or groups challenging these books have wanted them banned for a myriad of reasons. Anti-family (Saga by Brian K. Vaughan and Fiona Staples), “depictions of bullying” (The Absolutely True Diary of a Part-Time Indian by Sherman Alexie), and “controversial issues” (The Bluest Eye by Toni Morrison) are just the tip of the iceberg. All three of these works were among the top ten most challenged titles of 2014 and are part of our “Read at Your Own Risk!” display. Celebrate your freedom to read by checking out one of these books, on display in the library through October 5. During Banned Books Week, being held September 27 – October 3, stop by the Library Services desk to get a free Banned Books Week bookmark (while supplies last). And don’t forget search our Overdrive collection for downloadable challenged eBooks like The Hunger Games, Freakonomics, and Looking for Alaska. Fight censorship and celebrate your freedom to read during Banned Books Week from September 27 – October 3. Every year, there are hundreds of attempts to remove books from the shelves of bookstores, libraries and schools. Join us as Steve Sebelius and a panel of educators and experts discuss the current state of censorship in Nevada. In addition, staged readings of challenged and banned books will be presented. A reception will follow the program. Co-sponsored by the ACLU of Nevada, UNLV Libraries Curriculum Materials Library and Cockroach Theatre. Tuesday, September 29, 7:00 – 8:30 p.m. The sponsors of Banned Books Week are hosting a free keynote event during Banned Books Week that will feature an exciting conversation with some of the industry’s best-known banned and challenged Young Adult authors. The discussion will focus on the topic of censorship, each author’s experience being banned or challenged, and the importance of free and open access to all books, especially for young adult readers. David Shipler, author of Freedom of Speech: Mightier Than the Sword, will moderate the conversation. Coe Booth, author of Kinda Like Brothers. Funds raised during these exclusive events will be used to support SOI and CBLDF’s educational programs. A recent analysis of the top 100 banned books from 2000-2009 revealed that most challenged books involved characters and issues reflecting narratives outside of the dominant culture. However, books that reflect diverse narratives represent only a tiny fraction of published books. Are certain stories censored even before they are published, or not published at all? What does diversity mean in literature? Why should you read “diverse books”? Join authors Stacey Lee, Isabel Quintero, and Tess Sharpe, for an exciting panel discussion on the importance of diverse narratives, their current books, and more. The Audelia Road Branch Library is displaying banned books — including top ten most challenged comic books Persepolis and Saga and frequent targets The Fault in Our Stars and The Absolutely True Diary of a Part-Time Indian — to celebrate the right to read during Banned Books Week! 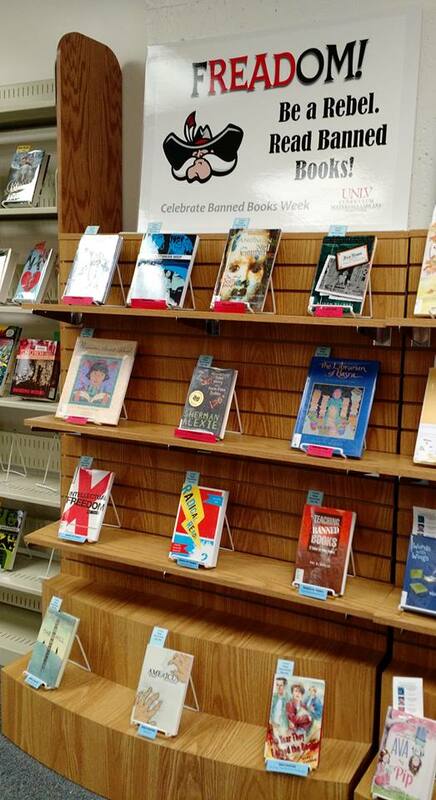 If you’re looking for a banned book to read or inspiration for your celebration, visit the library and check out the display below! Banned Books Week is sponsored by the American Booksellers Association, American Booksellers for Free Expression, American Library Association, American Society of Journalists and Authors, Association of American Publishers, Comic Book Legal Defense Fund, Freedom to Read Foundation, National Association of College Stores, National Coalition Against Censorship, National Council of Teachers of English, PEN American Center, People for the American Way Foundation, and Project Censored.